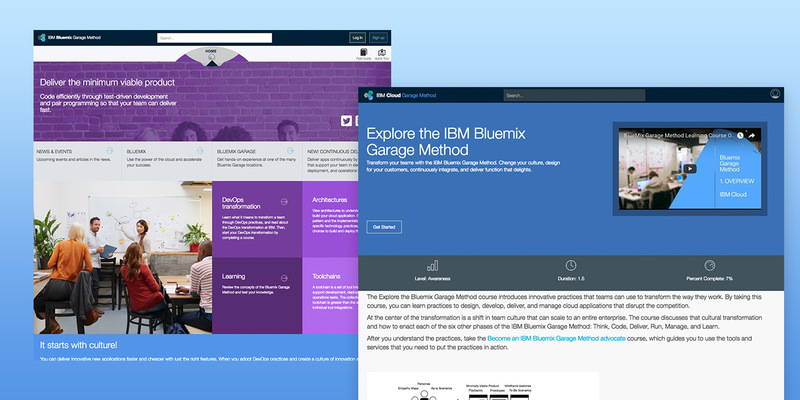 The team worked with subject matter experts across IBM to build a knowledge base for what could be built on IBM’s Watson & Cloud Platform and how to build it. User research insights fueled the need for this project from it’s conception. The team interviewed customers from our largest clients’ development teams to weekend developers. 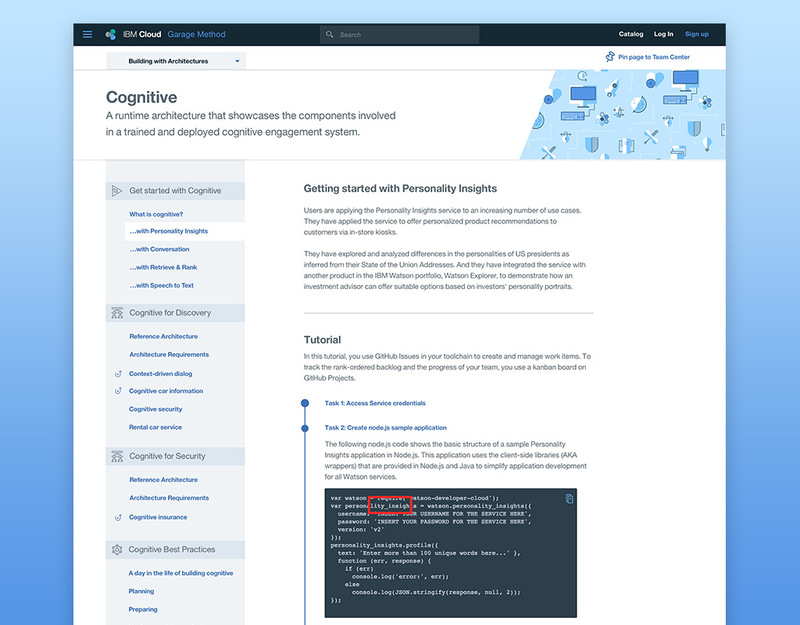 We consistently found that one of IBM Watson & Cloud Platform’s biggest issues was a lack of understanding of how to compose our individual cloud services to create the applications they needed. We discovered that the help existed, but was difficult for users to find. 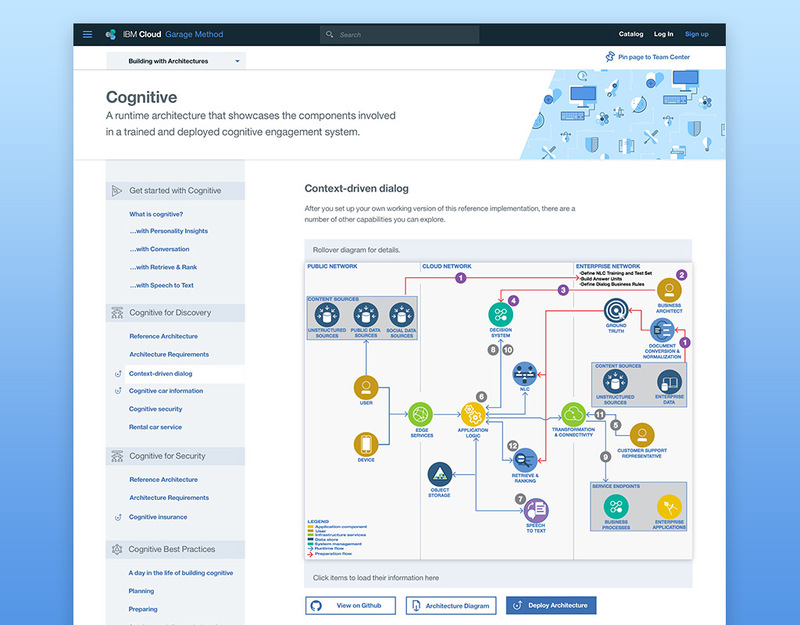 Feedback from client interviews, Sales, Support, and IBM’s services teams were all considered to make sure the team developed a comprehensive view of the issues users had across the platform. IBM’s cloud services are atomic elements. Alone they don’t make an application. 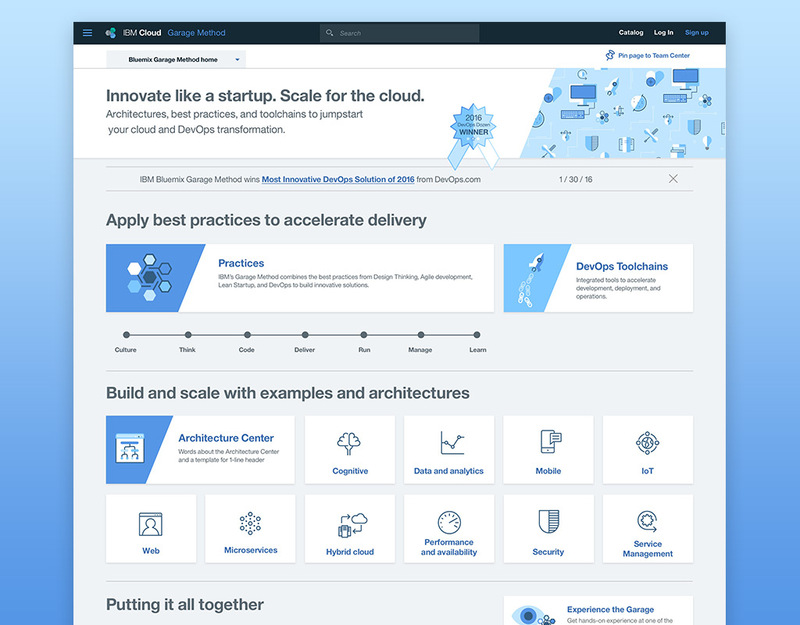 They must be combined to satisfy different use cases, and IBM’s platform experience did a poor job of helping application architects and developers understand what could be built or how to build it. Our best analogy was that it was like a user was trying to bake a cake and that IBM offered eggs, salt, sugar, milk, flour, etc. Too often, we didn’t even provide the salt. Instead we offered sodium and chlorine and expected our users to become overnight chemists and know that sodium and chlorine combine to become salt. Pair that with the fact that IBM gave users no recipes and “baking a cake” on IBM Cloud became a daunting task. 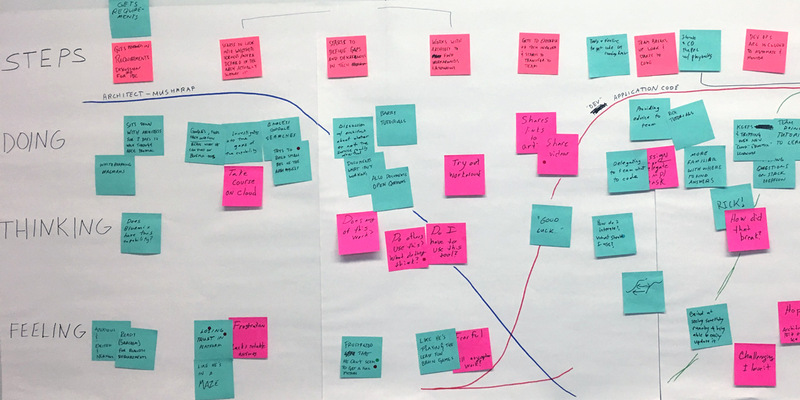 Mapping out the development lifecycle of not just users, but their teams helped us understand that different team members came on in waves. So, the experience needed to help early members handoff knowledge by grouping reference material used on the project. The knowledge existed. In fact a number of teams across IBM were trying to solve this problem. The issue was that each had built their own “hub” for this content. Many sites had been built out and users might find one or two, but were rarely aware of all of the sites they ultimately needed and certainly couldn’t search across all of them at once. The team’s mission became identifying all of these knowledge centers and helping those teams collaborate to add their content into a jumping off point that connected users with the content most relevant to what they needed to accomplish. During our research we found that developers sharply avoided anything that looked like marketing, and they had learned to look for the “nearest exit” to code or documentation. The existing designs for knowledge centers unfortunately fit that description, and we knew that the new designs had to more nakedly represent themselves as the help and documentation they were. 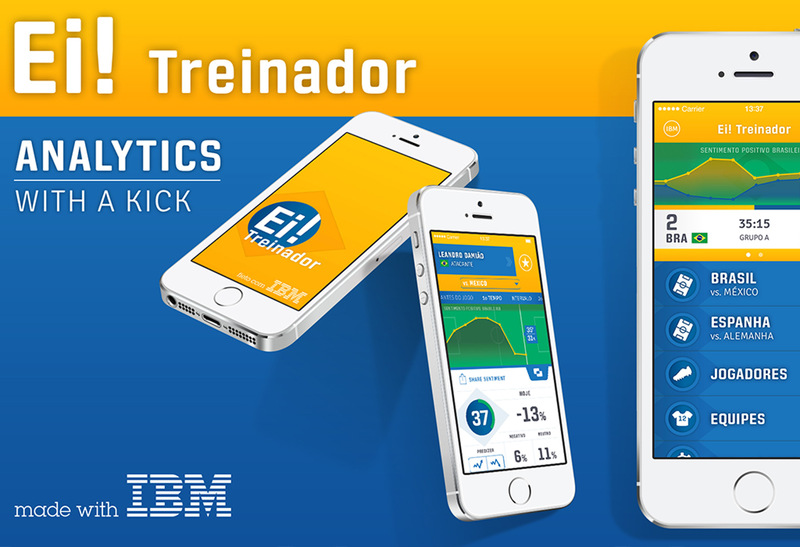 With so many stakeholders in and outside of IBM contributing to the knowledge base, the team had to balance a wide spectrum of user needs. 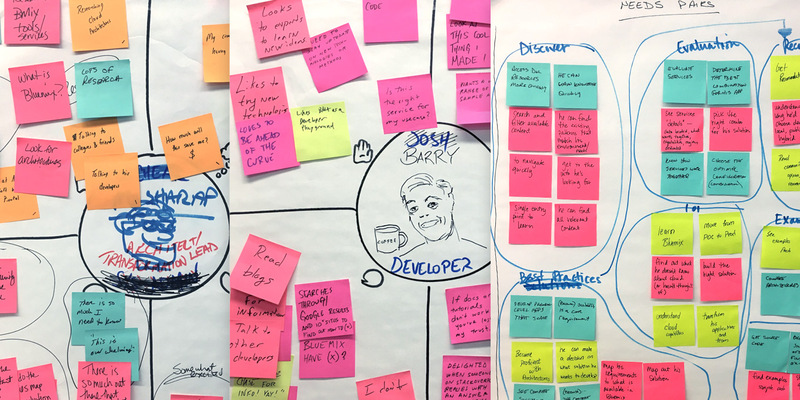 Quickly sketching and building lightweight prototypes to test with sprint to sprint helped the team understand that users had a variety of consumption needs. Our users weren’t just Developers and Architects, but included many flavors of each. 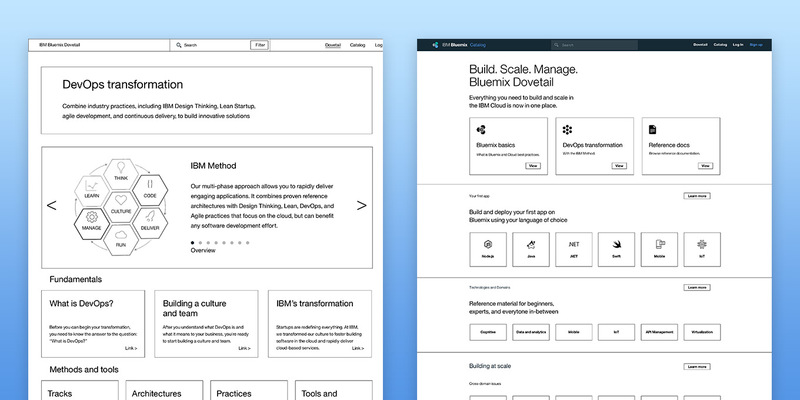 We had to design for “cloud mature” users as well as “cloud immature” who were learning cloud concepts like microservices, back-end-for-front-end, and chaotic testing for the first time. Developers needed to find guidance to inform early architectural decisions and then transition into more instructional how-to material when it was time to build those architectures. As such, the design’s first objective was to act as an operator to uncover the user’s motivation and then connect them with the content they needed. The team held working sessions with developers and subject matter experts to sketch through content needs and layout. The solution serves as a “single jumping off point” to help users find the content they need at their stage of cloud development. 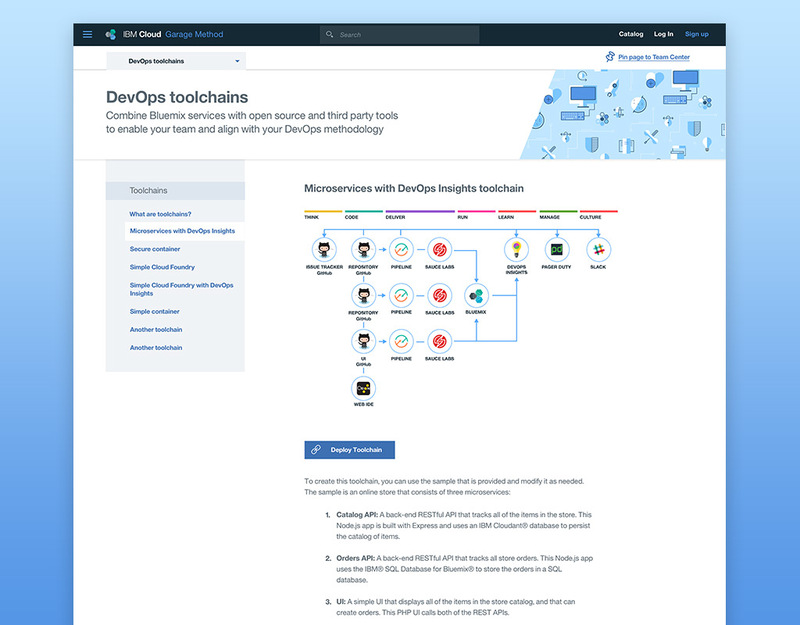 The layout and content also follow common documentation models to establish developer trust from the beginning, moving away from the previous marketing-esque look and feel. Once Architects found those insights and learned for themselves how to build their applications on the cloud, their next job was to educate their teams. To help facilitate that act, the design includes the ability to “pin” content to projects to be shared out as a collection of resources to their Lead Developers and development teams as they came onboard. We strove to get Architects into architectural diagrams and Developers into code as quickly as possible and once they found them, helped them educate their teams as well. The result was an 80% increase in user engagement in the first month alone.